Isn't She Lovely: Isn't She Lovely - Duffy / Plus a Giveaway! Isn't She Lovely - Duffy / Plus a Giveaway! * Super Power ~ To cure cancer! * Song on repeat ~ Cruise by Florida Georgia Line because Kaylee is obsessed with it. * At the end of this post there is a very lovely giveaway. Make sure you check it out! Just a few short months ago I was on Facebook and I noticed sort of a strange status update from a girl I went to high school with. You know how Facebook is. You have the opportunity to learn about people you hardly knew back then, let alone now. When I quickly read her status update about being in the hospital with her little girl it caught my eye, but I figured it was nothing big. They didn’t seem to know what was going on yet, and sadly I think that those types of statuses happen often. So when her status update became something to the effect of, “my seventeen month old has leukemia” I felt sort of stunned. As a mother you develop a gut reaction to these things that you never knew could feel so strong. The other mother could be a complete stranger and you want to hug her immediately and offer comforting words even though you know there aren’t any. I began to watch the information unfold closely as Duffy would post about her daughter Kaylee on Facebook. I then started reading every blog post Duffy created on Kaylee’s Battle page. As I read more and more of Duffy’s blog I found myself being uplifted by her. Her constant ability to be real about the situation while also being positive was incredible to me. 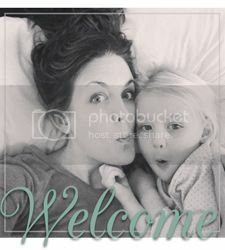 I looked forward to her posts, and I prayed so often for her little girl I felt like I was praying for one of my own. Not only that, I was still in the throws of struggling with my own grief over the loss of my dad. 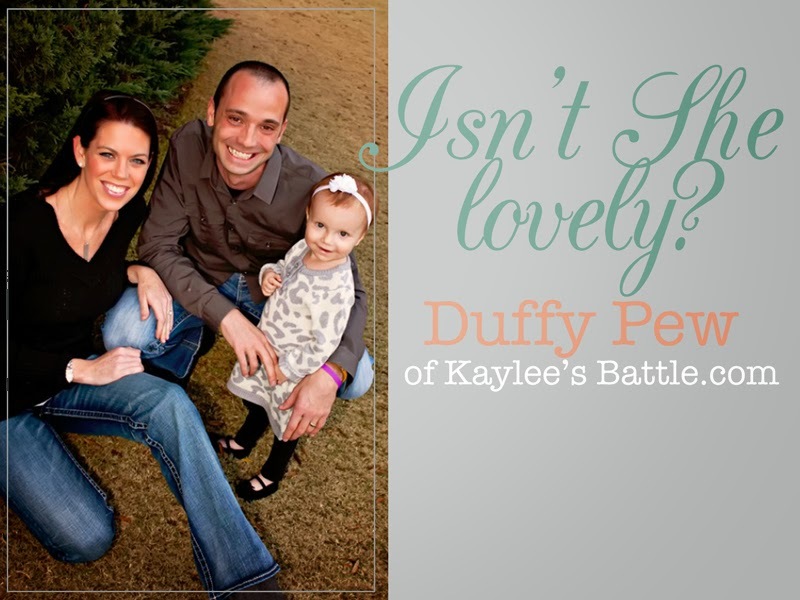 Reading about Kaylee and seeing Duffy’s immensely positive spirit did more for me than I could ever express in words. I interviewed Duffy and met Kaylee for the first time just before Thanksgiving. I also briefly got to meet Kaylee’s dad Chris. This little family has inspired so many through their blog and Facebook and they continue to do so every day. Today I share Duffy’s courage and her story with you as she is one of the loveliest people I have had the pleasure of getting to know better. 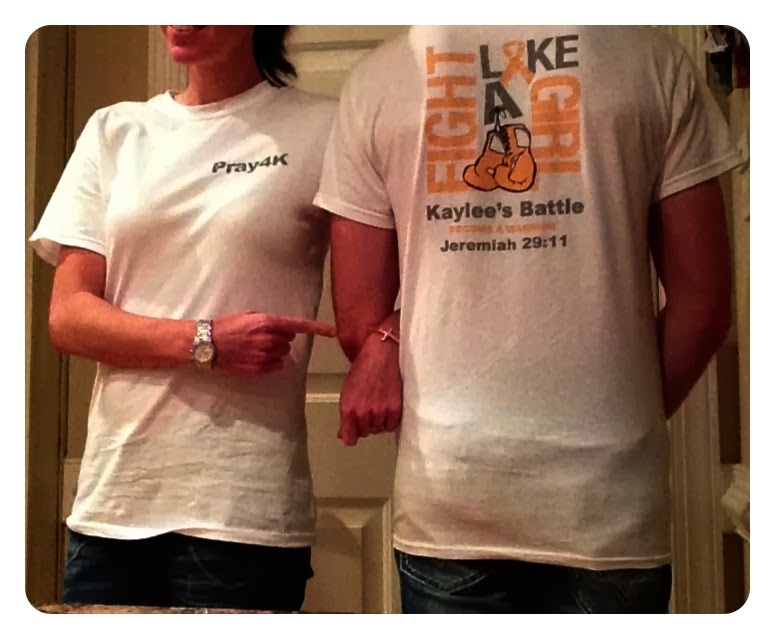 What type of cancer does Kaylee have and what were you told specifically in the beginning? The day we went to Scottish Rite we were told by the Oncologist within ten minutes of them taking her blood that she had leukemia. Of course, they began explaining so much in detail and I wasn’t retaining anything. The following morning they told us it was Acute Lymphoblastic Leukemia, or ALL. I do remember them saying that with ALL there is an 85% cure rate. Of course, I immediately thought about that other 15%. They were very on top of starting a plan. So we were trying to wrap our brains around our child having leukemia while listening to what the next steps would be. Next we were given binder upon binder with information. One in particular has everything from every detail about every chemo she’s going to be given to side effects and things to watch for. You can see what they’re called and what they do, but you also get to see what they could possibly cause. This outline of chemo is laid out over the next two to two and a half years. You really have to focus on the first list of side effects and try not to let yourself think about the “rare but serious” list of possible side effects. Have you experienced a lot of the side effects yet? The steroids have actually been one of the worst. They cause weight gain and moodiness similar to a bipolar disorder. Getting off of them is even worse because there is so much pain involved. She’s been on chemo since August and the side effects have been pretty consistent with what the binder says. Within your blog and whatever you put on FB you are consistently very positive. Do you find it hard to maintain that positivity? I think I’ve always been a pretty positive person, but I know I’m going to have those times where I fall apart. The blog is one of those things she’s going to read someday. If you think about all of the negatives that can happen it’s going to envelope you. We stay positive for her. She feeds off of us. If we constantly show her how to fight and constantly try to instill that she is doing an amazing job then she feels better and tries harder to cope. The first night after finding out we wallowed in our own self pity and Chris's uncle actually said, “no you can’t do that”. He explained that we needed to realize that we could sit here and feel bad for ourselves or understand that God’s got this. We began to realize that even though bad things were going to happen that we couldn’t control we needed to pray about them. Then, we needed to be thankful for the answered prayers. We are so thankful that she has the type of leukemia with an 85% cure rate. We’ve met so many people where that isn’t the case and they are more positive than we are. They lift us up. We’ve also met all types of people dealing with different types of cancer. The number one thing that stood out to me was when my mom called me one day after talking to a group of women about Kaylee. There was a woman in the group who told my mom that they pray for their granddaughter every day, but she has a brain tumor and she doesn’t have a very high chance of surviving it. She told my mom that she understood that what we were going through was very tough, but her family would give anything for what they are facing to be ALL instead. This really stuck with me and makes me think that if I ever start to feel bad about my situation there are people out there who would do anything to be in my shoes instead. That being said, your feelings about what you're going through are no less important. What has been the hardest part of this for you? I think what I struggle with the most is that she has to go through this. It’s not the “why me” or how this affects life in general. I would so much rather it be me. The hardest part is watching her hurt and be in the hospital in pain. We can be positive and we can try to lift her up and pray, but if she’s in pain we can’t do much about that. We just have to try to make it better. No parent should ever have to watch their child hurt like that. She’s taken it so well and we are so thankful, but it’s knowing that she will keep having to go through it and we can’t change that part that has been trying. I know that you rely a lot on your faith and that it’s a huge support for you. What other forms of support have come about that you maybe didn’t expect? So many friends from college and high school have reached out to us. At our high school in our grade there were so many people, but even from the grades above and below me there are people reaching out asking how they can help. People from college have come out of the woodwork too asking what they can do. It’s amazing to see. Right now we have had over twenty seven thousand page views on our blog. Churches have spread the story as well. Also, I would say people I’ve never met that heard about us from some random church have been inspiring. For instance, someone in Los Angeles wrote that they heard about us from a friend of a friend. It’s so amazing and supportive to see how her story is spreading. If you had to give any advice to another mom who is first learning that her child has cancer what would you say? I would say exactly what was said to us. Try very hard not to wallow and go down the woe is me path. Do the best you can to fight for positivity for you child. And, I would also suggest to avoid reading the worst case scenarios in regards to side effects because it can really bog you down. I want to say a HUGE thank you to Duffy for giving me the chance to feature her here. She is truly lovely and so is her sweet little girl.In an effort to raise money for medical costs Duffy and Chris have been selling “Pray4K” T-shirts. With shipping the cost of a shirt is $20.80. 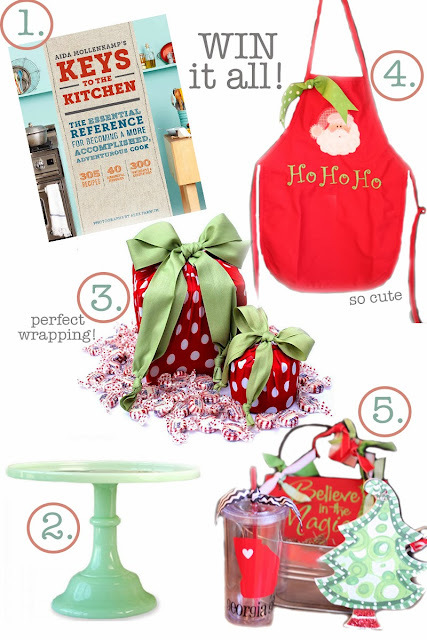 For this very special little girl and her family Isn’t She Lovely is offering up a wonderful holiday giveaway! If you go and buy a “Pray4K” shirt and put in the notes section (with your chosen size) that you were sent by Isn’t She Lovely you are automatically entered into the giveaway for the below prize package. These items are perfect as one big gift for someone, a bunch of small gifts to many, or even as a gift to yourself! In an effort to ship in time for the holidays, the winner will be chosen at random on Tuesday, December 17th. I promise to get the entire giveaway package to our lucky winner before December 25th! Click here to go buy a shirt by clicking on the BUY NOW link in the right column of the blog! UPDATE ON PRAY4K SHIRTS : The area where you put your size and Isn't She Lovely to enter the giveaway is sort of small. When you're at the paypal page to buy there is a sentence that says "Please enter shirt size here: ADD". Click the word "Add" and a text box comes up where you can put in your size and the phrase Isn't She Lovely. The sentence is in between the "Bill Me Later- Flexibility and more time to pay" button and the link that says "Don't Have a Paypal Account?". Thank you to those who have already purchased a shirt. Let's keep it going!